Learn to draw glossy Yin Yang concept diagram in PowerPoint in a matter of seconds. This article has been updated with step by step video tutorial. The symbol can be used for many different concepts. 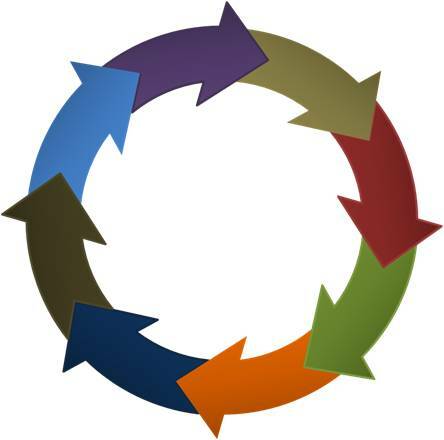 For example, it can be used to depict seemingly opposing forces that are interdependent. 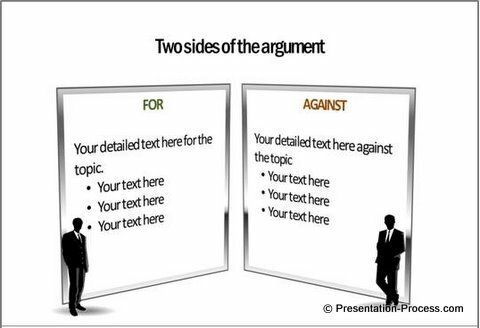 It can also be used to portray pros and cons of an idea or two sides or two sides of an issue. The symbol usually has a dot in each of the halves. 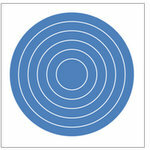 A simple circle of the same color as the background placed on the circles can achieve this. So, we leave it to you to create your own variations. The main objective of this tutorial is to show you how to create these stunning and professional shapes in PowerPoint. 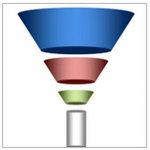 This tutorial uses Merge Shapes options that is available from PowerPpint 2010 upwards. You can follow this tutorial in PowerPoint 2010, 2013 or 2016 etc. Before we show you how to draw the shape, we want to show some alternative ways to represent pros and cons. 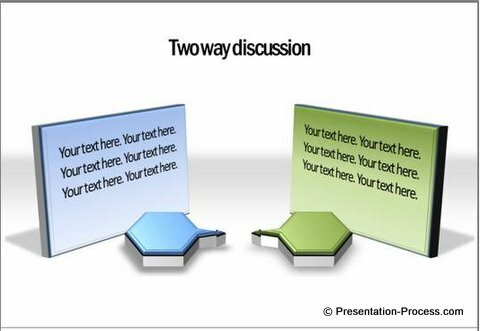 The following diagrams are part of our 750+ PowerPoint Charts & Diagrams pack. The pack has over 750 unique PowerPoint diagram templates you can ‘copy and paste’ to create professional presentations instantly. 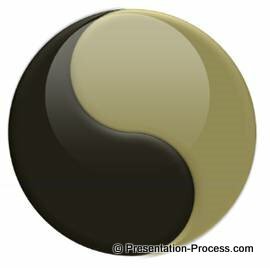 The diagram above is a much simplified version of Yin Yang symbol. We retained the glossy circular shape, but made the two halves fairly straight forward. 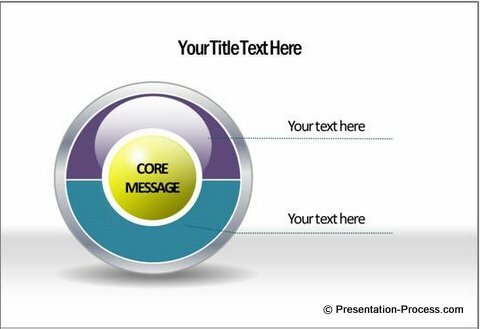 There is space in the middle to mention your core idea. This has just the two reinforcing arrows. These arrows can be made with SmartArt. The light effects and the shadows give a professional look to your slides instantly. The angle of text and the shapes make the slide attractive. You can change the color of the rectangular 3D shapes by using ‘Shape Fill’ option. 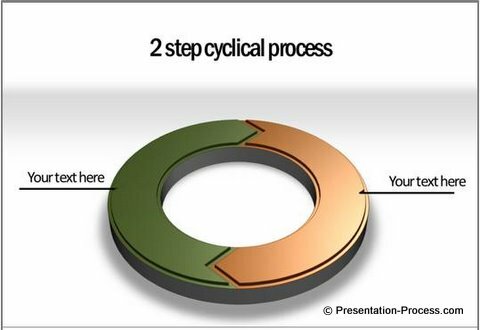 In a business presentation, ‘how you say it’ is as important as ‘what you say’. 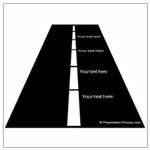 Using professional diagrams adds a touch of elegance and sophistication to your communication. 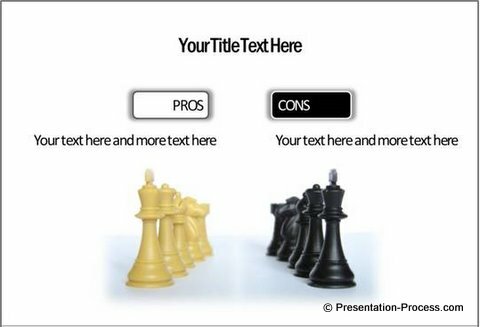 Since your slides stand for the brand promise and quality of your offering, it is worth the while to learn how to create high quality PowerPoint diagrams. If you liked this article, please leave us a comment below.